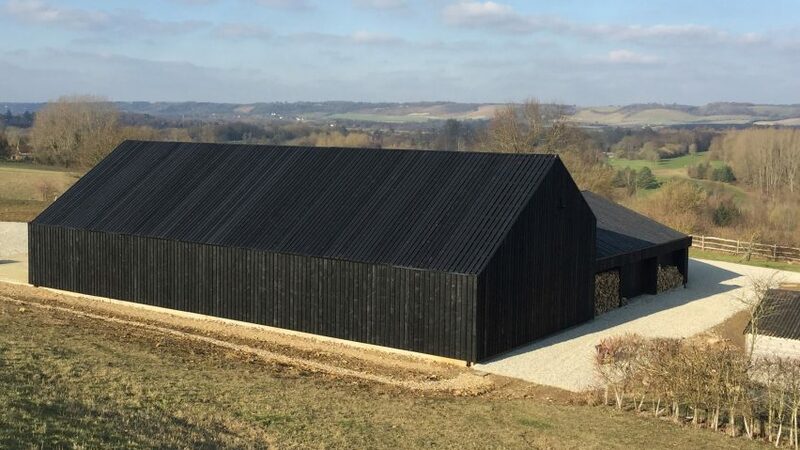 Macdonald Wright Architects has added a barn clad in black-stained boards to Caring Wood – a Kent country villa that is vying to be named the UK's House of the Year. Corvid Barn was erected close to Caring Wood house, which the London-based firm worked on with Niall Maxwell of Welsh studio Rural Office for Architecture. The carbon-neutral house, which is one of seven shortlisted for the RIBA House of the Year prize, comprises a cluster of volumes topped with angular tiled roofs that reference the area's traditional hop-drying oast towers. The house was granted planning permission due to its ambitious design and a commitment by the owners to plant 25,000 native trees on its grounds. The barn was built as a base for managing the estate's operations and contains storage, workshop and office spaces in two conjoined wings. Responding to the reforestation project and the client's request for a highly sustainable building, timber was the obvious choice for the main material for construction and cladding. "[The barn's] form and design were driven by functionality," said project architect Matteo Gallo, "[with] the need to provide practical storage and workshop space for a variety of activities, making the building key to the development of the estate in future years." "In keeping with the philosophy of the practice, Corvid Barn manipulates the English vernacular," Gallo continued, "combining traditional materials and ancient building techniques, with a sculptural aesthetic that clearly identifies it as a contemporary intervention." The building comprises two wings with dedicated functions positioned perpendicular to one another on a plot looking out across a bucolic landscape. The larger of the two wings accommodates a garage for heavy farm machinery, alongside storage space for timber, tools and materials. The simple gabled volume is supported by a frame made from green oak that is held together using traditional mortise and tenon joints. Large roof lights and gaps between the cladding boards allow plenty of natural light to illuminate the interior of what at first appears to be an entirely solid volume. The adjoining wing with its lower ridgeline houses a workshop and office for the estate team. Windows incorporated into the facades of this structure offer an enhanced connection with the landscape and the nearby main house. Both volumes are clad externally in rough-sawn redwood boards, which are stained black to create surfaces that contrast with the exposed framework. Doors and windows aligned with the cladding of the workshop wing enhance the feeling of a single homogenous volume. Photography is by Heiko Prigge.